(Newser) – An Atlanta mother says a hospital is putting her son's future in jeopardy because of the misdeeds of his father. 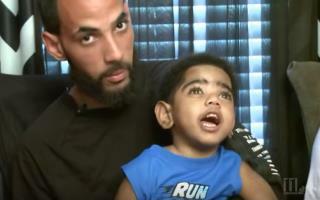 Two-year-old AJ was born a month early and without a working kidney, WGCL reports. According to WXIA, AJ had a stroke last month and may need bladder surgery. He also needs a kidney. Fortunately, his father, Anthony Dickerson, is a perfect match and a willing donor. "All I ever wanted was a son," Dickerson says. But Dickerson's criminal history is complicating matters. He was arrested last month for parole violation and weapons possession. Regardless, Emory Hospital had scheduled his and AJ's surgery for Oct. 3 and even requested Dickerson be temporarily released from jail last month for blood work, the Atlanta Journal-Constitution reports. "In order to avoid a rejection they nuke the immune system of the recipient. That means any disease, any at all, that would normally be fought off, won't be. So if the dad was exposed to say, tuberculosis (which generally is only a problem for immunocompromised people and is like tetanus in that it is everywhere), and he gives it to his kid straight from jail, the kid will immediately get tuberculosis and die. It might even happen with the common cold, because the kid just has no immune system at all at the time of and immediately after, the transplant. Edit: To the repeated question: Diseases take time to incubate and for an effective test, they wait for three months after having been in high risk areas (like jails). Red Cross waits four times as long, per the top comment. Wouldn't do for a dormant infection that doesn't affect a healthy person to cross into an immunosuppressed child. Even the common cold could kill him. Since the child can survive just fine on dialysis for a few months, they're taking the safest route for the child. In no way is the hospital punishing anyone. They're doing what is medically the best thing. And I'm done with this thread." Not an old person. Not a criminal. Probably about as innocent as a person can get in all aspects of the word. What ever happened to 'Do no harm'? Hospital administrators are the worst. I would have to ask if one of the conditions of his parole was not using any sort of booze or drugs(which I assume could cause trouble in a transplant) and has the father been struggling with these things? Otherwise seems fishy.